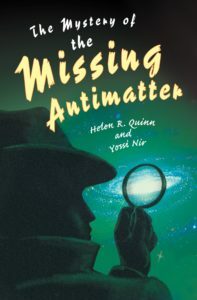 There’s an awful lot of articles about antimatter and mystery. For example there’s a 2017 Symmetry magazine article matter-antimatter mystery remains unsolved. It’s about the BASE experiment at CERN where they’ve measured the antiproton magnetic moment. Surprise surprise, it’s the exact opposite of the proton magnetic moment. Then there’s the LiveScience article mystery deepens: matter and antimatter are mirror images. Of course they are, the positron has the opposite chirality to the electron. And then there’s the CERN courier article does antimatter fall up? No it does not. Note how Einstein referred to a body and the electron on the same line? The mass of an electron is a measure of its energy-content. Hence when you trap a massless photon in a gedanken mirror-box, the mass the system is increased. When a photon is propagating linearly through space we call its resistance to change-in-motion energy or momentum or energy-momentum. When the photon is going around and around inside the box we call its resistance to change-in-motion mass. This is relevant to the electron because of the wave nature of matter and because the electron’s spin is real, as evidenced by the Einstein-de Haas effect. Hence you can liken an electron to a 511 keV photon going around and around in a box of its own making. It’s the same for a positron, but since the positron has the opposite chirality, you can liken it to a photon going around and around the other way. So if you have three gedanken boxes, one containing a 511 keV photon, one containing a 511 keV electron, and one containing a 511 keV positron, they all have the same mass. That mass is positive in all cases. There are no things with a negative mass, just as there are no pencils less than zero inches long. Hence there is no runaway motion comprised of “a push that repels the positive mass from the negative mass, and a pull that attracts the negative mass”. It’s all pull. In Newtonian terms the gravitational force between two masses is F = G m1m2 / r². The force pulls the masses towards one another. It doesn’t push them apart. So when you let go of your boxes, the box containing the positron doesn’t hit the ceiling. They all fall down. The reducing speed of light is transformed into the downward motion of the electron or positron, and internal kinetic energy or mass-energy is converted into external kinetic energy. The latter tends to get radiated away, resulting in a mass deficit. But note that only the horizontal component bends down, so the Newtonian deflection of matter is only half the deflection of light. And since you can diffract not just electrons and positrons but protons and antiprotons and neutrons too, the same principle applies to all matter and antimatter. In this sense the positron is a mirror-image time-reversed electron. Note that it isn’t time-reversed because it’s an electron travelling back in time, as per Wheeler’s one-electron universe. Also note that the electron isn’t actually a doughnut, and nor is a positron. 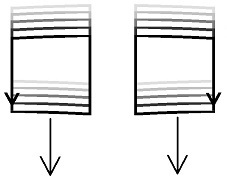 The Williamson / van der Mark image features “onion rings” in the sectional slices. You need to keep adding bigger and bigger rings until you inflate the torus to near-spherical symmetry, see Adrian Rossiter’s torus animations. Then you have to keep on going, because the electron doesn’t have a surface. In similar vein it isn’t some thing that “has” a field. Field is what it is. It’s a “standing-wave field construct”, and so is the positron. It’s published by Princeton university press, originally in 2008. Helen Quinn is professor emerita at SLAC whilst Yossi Nir is professor of physics at the Weizmann Institute of Science in Israel. His 2014 presentation 10+1 best reasons to like CP violation makes interesting reading. He had me with otherwise we would not be here. He goes on to talk about the three necessary Sakharov conditions, and says it’s a window to the early universe that proves the standard model wrong. You don’t hear that sort of thing every day. His seventh and eight reasons are QCD is CP invariant, and QCD is not CP invariant. I liked his last reason too: the joy of science. As for what happened in the early universe, I don’t know. It isn’t like particle physics where we can measure the deuteron magnetic moment. The evidence is thin, there’s much more inference, and there’s a temptation to retrofit. But I couldn’t help noticing that electromagnetism features in the Brookhaven RHIC article perfect liquid hot enough to be quark soup. It’s talking about a quark-gluon plasma or QGP, which “filled the universe a few microseconds after it came into existence 13.7 billion years ago”. The article says such a perfect liquid doesn’t fit with the usual picture of free quarks and gluons. I’d agree with that, and then some. In fact I’d say it’s something like pea soup, the point being that there are no actual peas in pea soup. In similar vein there are no actual quarks in a quark-gluon plasma. There are no actual gluons either, because the gluons in ordinary hadrons are virtual. As in not real. As in do not exist. The article also includes a video showing heavy ions with a spinor-like rotation, a glancing collision that sets up a dipole magnetic field, then vortices and charged-particle separation. Great stuff. It finishes with a picture of a spiral galaxy, which of course has a whirlpool aspect. It’s a shame about the multicoloured billiard balls, but never mind. The narrator says “this asymmetry at RHIC may help scientists understand a similar violation of symmetry in the early universe that resulted in the predominance of matter over antimatter in our world”. All this is familiar territory if you’ve read Maxwell’s theory of molecular vortices. Heaviside didn’t develop gravitomagnetism as an analogy of electromagnetism for nothing. Like the gravitomagnetic field, the electromagnetic field has a frame-dragged vorticial or “screw” nature, but much fiercer. Plus it sits rather well with another RHIC article scientists see ripples of a particle-separating wave in primordial plasma. Note the quote from Gang Wang: “this ‘chiral separation’ acts like a seed that, in turn, causes particles with different charges to separate. That triggers even more chiral separation, and more charge separation, and so on”. A seed sounds interesting. After all, from little acorns do mighty oak trees grow. Especially since on a grander scale there’s galaxy sized twist in time pulls violating particles back into line. That’s a Warwick university news article featuring Mark Hadley. He’s suggesting that the rotation of our galaxy results in frame-dragging, and that this causes a difference in the decay of matter and antimatter versions of the kaon and other particles. The related paper is the asymmetric Kerr metric as a source of CP violation. Interesting stuff. Especially since on an even grander scale there’s this: mystery of the missing antimatter solved by the magnetic field that spans the cosmos? It dates from 2015 and features work by Tanmay Vachaspati and others. 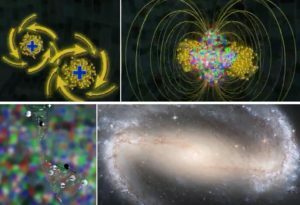 It talks about the discovery of a left-handed magnetic field that pervades the universe, wherein “the entire universe is filled with helical (screw-like) magnetic fields”. In electromagnetism the word rot is short for rotor, because the screw nature of electromagnetism is all about twist and turn and things going around and around. Not just electrons in solenoids and electric motors. Things like the Poynting-vector energy flow within the spin-½ “spinor” electron. Electrons spin, protons spin, the Earth spins. The Sun spins, neutron stars spin, galaxies spin. Particles and antiparticles might be equal and opposite, but they are spinors. They are themselves vortices, with a real rotation. An intrinsic rotation that makes them what they are, like a tornado’s rotation makes it what it is. In a rotating environment, where there’s frame dragging and a space-time vortex, space is twisted. Then the motion and behaviour of those particles and antiparticles is no longer equal and opposite. And get this: if you were moving through a region of twisted space but didn’t know you were moving, you might think you were situated within a turning region. Since space is a continuum, there are no freewheeling discontinuous regions of space within space. So you won’t be finding any magnetic monopoles any time soon. The only way space can turn is if it somehow all turns. 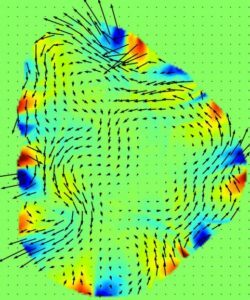 So did the early universe spin like the ultimate magnetic monopole? I cannot rule it out, and I note that the electron magnetic moment is −9284.764 × 10−27 J⋅T−1 whilst the proton magnetic moment is a mere 14.10606 × 10−27 J⋅T−1. The spin is going the other way around a much smaller radius, and the angular momenta are not equal and opposite. The article says scientists study this QGP in particle accelerators, where nuclei moving at near light speed collide, sending temperatures skyrocketing to trillions of degrees. It says the protons and neutrons then melt, and that the “soup” produces structures “shaped like rings and vortices”. See this quote which refers to Xin-Nian Wang: “Wang’s calculations show that the fluidic plasma in the vortices should generate lots of short-lived particles, called lambda baryons, with spins in the same ‘direction’ (either ‘up’ or ‘down’)”. Who’s to say it doesn’t create some long-lived particles too? Or if you then have charged particles moving in different directions, any directed back into the QGP will be melted and destroyed. That’s CP violation in spades. And for a bonus ball, some liken a quark-gluon plasma to a Bose-Einstein condensate, and some liken a Bose-Einstein condensate to a black hole. Yes, there’s another way to destroy a particle: drop it into a black hole. You can find some articles that say black holes do not destroy matter, but I’m confident that they do. I’m also confident that you can effectively break an electron like you can break a spinning disk. Parts fly off in different directions, and angular momentum appears to have vanished. I’m confident this can happen to protons too, which brings me back to something else about those electrons and those protons with their mismatched angular momentum: there’s an awful lot of hydrogen in the universe. In terms of mass, circa 74% of normal matter is hydrogen. There’s an awful lot of helium too, circa 23%. Check out big bang nucleosynthesis. Apart from a trace of lithium it would seem that other elements were made later in stars. See periodictable.com for a chart. Oxygen makes up circa 1% of normal matter, carbon circa 0.5%, iron circa 0.1%, and so on. Hydrogen is primarily made up of electrons and protons, whilst helium and the heavier elements are made up of electrons and protons and neutrons. If the neutrons were free, they’d undergo beta decay and turn into electrons and protons and neutrinos. Let’s simplify matters by setting the neutrons and neutrinos and antineutrinos aside, and say that in some respect matter is made up of electrons and protons. Can you hear the dog barking in the night? I can’t either. There does not appear to be a surplus of electrons as opposed to protons, or vice versa. There’s baryon asymmetry, where we see lots of protons but hardly any antiprotons, but there’s also lepton asymmetry where we see lots of electrons but hardly any positrons. And they match. How can CP violation explain that? Wilfried Buchmüller tries to explain it on scholarpedia and elsewhere. But he relies on heavy Majorana neutrinos and “sphalerons” and inflation, all of which remain hypothetical. I am not convinced that sphalerons convert antiprotons into electrons, conserving the B-L difference between the baryon number and the lepton number. In this universe, that difference is zero, and I do not believe in coincidences. I do however believe in going back over everything with a fine tooth comb looking for clues. Is there something we’ve missed? Something we’ve taken for granted? I think there is. This: “there is good evidence that the universe is mostly made up of matter and no antimatter”. Now I have to put proton into the spreadsheet. I shall do this based on particle properties alone. It isn’t much like the electron, and it isn’t much like the positron either. But since it’s positively charged like the positron, the proton is more like the positron than it’s like the electron. So I’ll put it under the positron. That leaves only one cell free, so you have to put antiproton under the electron. Hydrogen, which consists of an electron and a proton, isn’t matter or antimatter. Like positronium, it’s both. Something else that’s both is the neutron, which consists of an electron plus a proton with an antineutrino twist. It’s similar for antihydrogen, which consists of an antiproton and a positron. And for the antineutron, which consists of an antiproton and a positron with a neutrino twist. It’s both too. And yet they call it antimatter. Antimatter is so labelled only by convention. A convention that forgets that the particles are matter or antimatter, and that four out of six combinations are both. A convention that forgets that the neutron can’t just be matter if it decays by spitting out an antimatter antineutrino and splitting into two matter particles. Understand this, and the mystery of the missing antimatter looks rather different. I am reminded of the old Chinese game of Go. Let’s say that “eyes” are not allowed, and I that play with blue counters whilst you play with red counters. If I win, the board is full of blue counters. If you win, the board is full of red counters. Either way we’d call it matter, and either way, one of us is going to win. I’ve never drawn a game of Go in my life. I’ve never drawn a game of tennis either. Tennis has tie-breakers, not draws. It doesn’t matter how evenly matched the players are, one side is always going to win in the end. In our universe, the blue team won. The losing side was the red team. Because the game they played wasn’t like just any game of tennis. It was like mixed doubles. Unfortunately the mystery of the missing antimatter rather suggests that the men won, and then asks what happened to all the women? Even though electrons and protons are attracted to one another, like men and women are attracted to one another. They form a stable bond, and we call it a hydrogen atom. Sometimes it’s a very close bond, and then we call it a neutron. Such a bond is stable in the right environment, such as in an atomic nucleus or a neutron star. It’s similar for positrons and antiprotons. Yes, electrons are also attracted to positrons, but that’s a fatal attraction. It tends to end badly. Ditto for protons and antiprotons. They annihilate too. Like I said, I don’t know what happened in the early universe, but I do know that biology offers some interesting analogies. Some say circularly polarised radiation may have caused the selective destruction of one chirality of amino acids. That’s interesting because antimatter causes a Faraday rotation that goes the other way, and there’s such a thing as induced beta decay. Intense electromagnetic fields have been mentioned, as have photons, see photobeta decay. Something else that’s interesting is the idea that the early universe started out like a black hole, and somehow evolved like a time-reversed stellar collapse. Yes, there’s pair production and annihilation, but there’s pressure too, a great deal of pressure. Is it hot? I suppose it is, but the “coordinate” speed of light is very low, so it isn’t quite like the inside of a star. Perhaps it’s more like a neutron star, and an antineutron star too. There may be protons and electrons and electron capture, and therefore neutrons. There may be antiprotons and positrons and positron capture, and therefore antineutrons. Perhaps it’s something like a crucible, one where charged particles are swept to the left or right and back down to a place where they are destroyed. Perhaps only neutral particles can make it to the surface. Perhaps there’s a rotation such that antineutrons don’t make it either. Or perhaps there’s some kind of seeding the mix like Gang Wang’s chiral separation. A seed is the ultimate butterfly effect, the ultimate for want of a nail. Perhaps one small chance event gave an advantage to the blue team. As in a battle, an advantage can be magnified. Then the chances of survival for members of the losing team start to diminish, which tips the odds further. Before you know it you’ve got a stability tip, and it’s game set and match. I don’t know why the blue team won, but I think we’ll find out one day, and then the answer will be obvious. Meanwhile I think there’s a lesson to learn: there can only be one winner, and either way, two opposite chiralities survive. There was a winner because like Yossi Nir said otherwise we would not be here. So here we are, and we don’t find right-handed amino acids where we live. Or left-handed sugars, and we don’t wonder about the mystery of the missing anti-sugar. Because we know the difference is merely chirality. 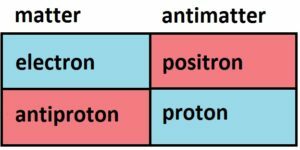 What’s the difference between the electron and the positron? Chirality, nothing else. That’s the difference between matter and antimatter. The electron and the proton have the opposite chirality. So hydrogen is a combination of matter and antimatter. We say the electron is matter, and the proton too. But we ought to say the proton is the antimatter. Then since the proton is 1836 times heavier than the electron, antimatter is a lot more common than you might think. Weight for weight, and pound for pound, 99.95% of everything around you is made of antimatter. Where’s all the antimatter gone? Nowhere. Because it’s hiding in plain sight. Because truth be told and by and large, you are made of it.